Prerequisite: Basic knowledge in mechanical/electrical or design/drafting or engineering or technical background. Methods of Instruction: Lecture, Reading, Hands-on assignments, and projects (trainees are encouraged if allowed, to bring actual work projects). 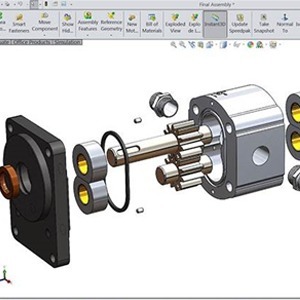 Course Description: This course is designed to expand and enhance trainee’s knowledge and ability in their respective field, and combine it with SolidWorks design techniques and capabilities to produce drawing plans. This course covers all the basic functionality of drawing automation: view and section creation, dimensioning, bills of material, update all views to reflect dimension change, visualization and rotation of design, creation of families of parts, varying assembly configurations, collision/interference detection, modeling and animation, 3D photorealistic rendering of design, relationship between dimensions and geometries, calculations, perform 3D finite, generate 3D CNC machine parts and more. Employee (Trainee) – must be permanent full-time (minimum 35 hours a week). Employee (Trainee) – must earn a minimum $22.77 per hour (if making less please contact [email protected]). Employee (Trainee) – must complete the class. Employee (Trainee) – must remain with the employer 90 days after completion of training. Call Barry at (949) 393-8866 or email [email protected] to learn more about State-Funded Training Programs.